Registration is open to all Virtual Assistants and Virtual Professionals - whether you are in business as a VA or thinking of starting a VA business. Special discounts are included for IVAA members and IVAA Trial Members. Non-members are welcome but will pay a higher fee, which includes a one year membership to IVAA. Conference dates: Wednesday, May 8 thru Friday, May 10, 2019. Conference sessions on May 8 will be held from 1:30-5:00 p.m., followed by a welcome dinner at 6:00 p.m. The conference continues from 9:00 a.m. to 5:00 p.m. with breakfast and lunch provided on May 9 & 10. We are offering a choice of Pre-conference Workshops on May 8 from 8:30 a.m. to 1:00 p.m. Cost is $125 and includes lunch. You can choose from New VA Workshop or Mastermind Session. Click here for details about each of the Pre-conference Workshops, or register below. Feel free to fly in early to join us as we explore San Antonio on Tuesday, May 7. Cost is just $47 for the bus tour led by a professional tour guide. Click here for complete details. Purchase Now For IVAA Members Only. Includes a 1 year membership to IVAA! OPTIONAL WORKSHOPS ** Add your pre-conference workshop at the checkout and it will be added to the 2 pay option). ONLY applicable if purchased together. Tracey D'Aviero to help you get your VA business up and running. get your plans into action. Presenters have prepared sessions designed specifically for Virtual Assistant industry professionals, focused on providing you with inspiring ideas and tools to help your business grow. Funday Tuesday in San Antonio - explore the area and connect and meet new and old friends. Before Jan 1, 2019 you will receive an 80% refund of the total registration fee paid. Between Jan 2, 2019 and April 1, 2019 you will receive a 50% refund of the total registration fee paid. After April 1, 2019 registration fees are non-refundable. For winners of free tickets as prizes from Summit events or other promotions who choose not to attend, these tickets are non-transferable, non-refundable. *All refunds must be refunded on the same credit card as purchased. 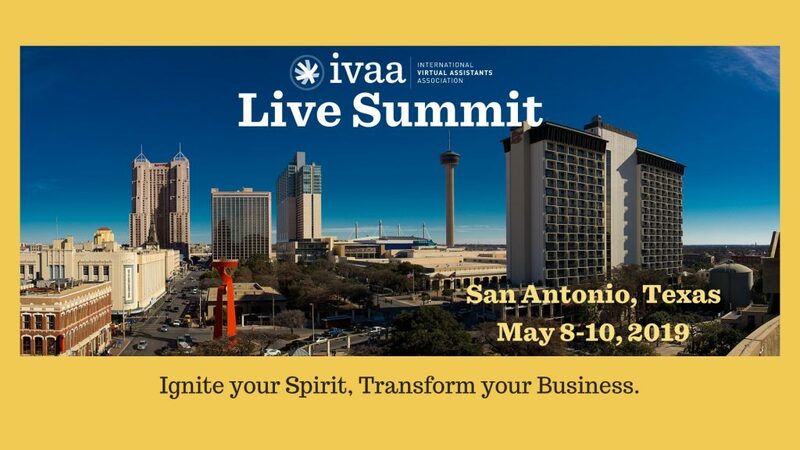 If you are unable to attend the conference for any reason, you may transfer your registration to another IVAA member for a $75 administrative fee.